Believe it or not, the Dog Training Business can be the key to a financial empire. For those who have a love for dogs and a talent to create a well behaved dog with a positive training approach, the financial rewards can be substantial. This can be the start of a business that can grow beyond what you might think possible. There are multiple income streams that can be built and it’s being done all the time. Why not become a part of this lucrative market? It’s big enough that you can probably pick and choose your customers after you get established so it is quite possible that you can specialize in a particular type of dog. Since this is a website that is devoted to Pugs we would naturally suggest that you consider this cute little breed but that, of course, is up to you. 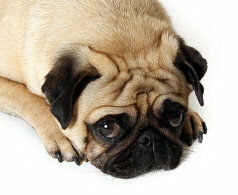 Pug owners should definitely be part of your target market because you usually have a passionate owner who wants the best for their dog and because many Pug owners have a little bit of trouble in being a disciplined trainer. They like to give in to their little friend. After all, they’re awfully cute! That, by the way, plays right into your hands of building another income stream for your dog training business: training the owner! The idea of multiple ways to make money is very attractive for any business and this particular business lends itself very well to that purpose. It doesn’t take much extra effort to turn your knowledge into extra income. A little booklet about training tips for the owner can either be a bonus give away or an added income. The dog training business has come to the Internet in a big way. Just do a search on the subject and you’ll see that there are countless ways to make money at this. But when you are first starting a dog training business you want to start small and build a reputation. Naturally you can start with your own dog. Having a dog who is so well behaved that people comment on that fact can easily lead to the start of a business. When you receive such a compliment it’s only natural to thank them and make note of the fact that dog training is something that you do. Having a card ready to share is the first step in building a contact list that you want to grow and maintain. Having a well trained Pug is some of the best advertising that you can get. They’re so cute that they’re natural attention getters and, when they’re well behaved as well, they are almost irresistible. If you’re going to be serious about a dog training business you should definitely check into whether any certification is required by your local government. You should also check into the American Kennel Club certification programs. Having your own dog certified is a great credential to have and definitely legitimizes you as a dog training business professional. Here is a program about starting a Dog Training Business that you may want to check out! As we noted before, having a booklet or a training course will also add to your reputation. People are very particular about whom they will trust their dog to so this business lends itself very well to maintaining a professional image and building a contact list. We may be a bit prejudiced but we think that the Age of the Internet has made doing this online the best possible and most cost effective way to do this. Most people would not immediately think of the Internet when they think of a dog training business but we would argue that you should think of the world wide web when you think of any type of business. By putting what you know about dog training or any other topic you open up the possibility of someone paying you for that information. Information is the best selling product of all time. Providing valuable information on a topic can be the best first step in building any business. You can give it away for free and come out ahead because when you provide information you build a relationship. When that person needs that service, many times they will go to someone they already know. The dog training business is an excellent field if you have the talent, skills or even just the information to build a part time or full time income. It is a skill that is in demand and a good dog trainer is, indeed, a professional. There are courses that you can take and you may want to consider an online course first to see if this is something that you would be interested in. Getting started in this field, for most people, happens almost automatically. If your dog is well trained, as we noted before, people will notice and that is the first step. Offering hourly sessions or a training package becomes a natural next step. Dog training can provide you with very lucrative fees when you’ve established yourself. The only problem with only doing dog training is that once the dog is trained your income stream has dried up. Offering follow up services provides an excellent source of added income. This can be something like dog walking or dog grooming services. Once you have successfully trained a person’s dog you become a natural candidate for these services and these are done on a periodic basis so your revenue stream can grow quite rapidly. Since there are so many hours in a day, you might consider having other people do the dog walking or dog grooming and collecting a commission on their revenue. In this case you have referred a customer to them that they would not have had without you so they will gladly pay you the referral.